If you’ve been in an emergency of any kind, you know how difficult it can be to stay level headed and act appropriately to salvage the situation—especially if you’re not prepared for it. That’s why your emergency dentist in Scarborough is here to help you stay prepared for dental emergencies if an accident does ever happen. You should know these 5 steps to keep cool, calm, and collected until you reach your expert dentist. 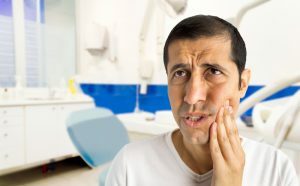 First of all, you should know that there are two different types of dental emergencies: accidents that need urgent care and those that can wait for a scheduled visit with your dentist. If you find yourself facing either, there are a few steps that you should take to maintain your smile as best as you can until you’re able to see your dentist. Either way, you need to know how to handle these situations in the proper way quickly so that you can save your natural teeth from permanent damage. No matter what—even if you’re lost a whole tooth or row of teeth—you need to stay as calm as possible. Even through the pain, you have to be able to follow through with the following steps to have a chance at recovering your smile. 2. Call Your Dentist Right Away! When faced with an emergency, you need a dental expert that’s easily accessible to walk you through what you should do over the phone. Calling your local emergency dentist can help you to complete the necessary steps to save your teeth. 3. Schedule An appointment Right Away! Typically, your dentist will be able to schedule a same-day visit to address your problem. This is great for people who are uncomfortable because of their dental emergency. However, if your issue isn’t as urgent, just be sure to schedule a visit for the next time it’s convenient for you. Your dentist will probably tell you this over the phone, but it’s important to gather all of the materials that were involved in the dental accident. For instance, if you have a knocked-out tooth, be sure to recover it and rinse it off, but DO NOT remove any soft tissues from the tooth itself. Store it in a container of milk until you’re able to make it to our office. 5. Drive Safely to Our Office. You don’t need any more accidents! Be sure to abide driving laws while traveling to our office to ensure you make it safely. It’s best to turn to a trained dental professional for assistance with an urgent dental emergency. Don’t hesitate to give us a call for assistance if you need it. Here at BAL Dental Centre, you should know you don’t have to face scary situations alone. In fact, we’re here to help you recover from the worst dental situations with swift, effective, personalized dental care. Call us when you need us!